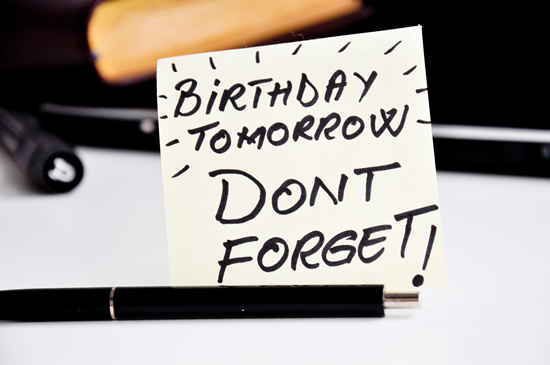 Did your husband just forget your birthday? If so, you’re understandably irked and a little hurt. You’re the most important person in the life of your husband but you sure aren’t feeling like it at the moment! As you process feeling hurt and angry, here are some thoughts to help work through the disappointment. There are some things you can do to decrease the odds of something like this happening in the future and to even salvage this year’s birthday. Your husband likely cares very much about you but is busy. He also may be a procrastinator which only makes things more difficult for him. In his mind, he has plenty of time. But, one day, your birthday arrives quicker than expected and he’s quickly in the doghouse. Although you may want your husband to surprise you, it’s still a good idea to drop hints in the days and months leading up to your birthday. You can share about how excited you are for the approaching day. You can also let him know about things he did in the past for you on your birthday that were special. By giving your husband plenty of “warning,” you’re less likely to be disappointed. Your husband will feel more prepared, less last-minute pressure and be able to enjoy celebrating you better, too. Now that you’ve prepped your husband for the upcoming day, don’t stop there. Drop hints about what you have in mind for a successful, happy birthday. After all, mind reading likely isn’t one of your husband’s gifts. If you don’t do this, he may be baffled as to why you’re not excited to celebrate your birthday at home eating Cheetos and watching television together. Many guys would be fine with something like that. Your idea of a great birthday and that of your husbands could be vastly different. Maybe your thoughts of a fun birthday involve going to your favorite restaurant together. You can give your husband a few restaurants to choose from so it’s still a surprise. Maybe you’re the adventurous type and want to kayak down a river with your hubby, for instance. Have him pick an outfitter and stretch of river you would enjoy. You can also drop hints about the type of gift you would like or emphasize how meaningful a handwritten card would be. All said, be sure to make your husband’s birthday special, too. If you just skip over his special day but want the full treatment on yours, it could feel unfair to him or communicate that it’s ok to not take your day seriously. As much as you feel like it, there’s no need to freak out. This thing can still be salvaged! Any good, caring husband should be OK with that kind of proposal. The best thing is that you don’t have to wait until next year to have a fantastic birthday!